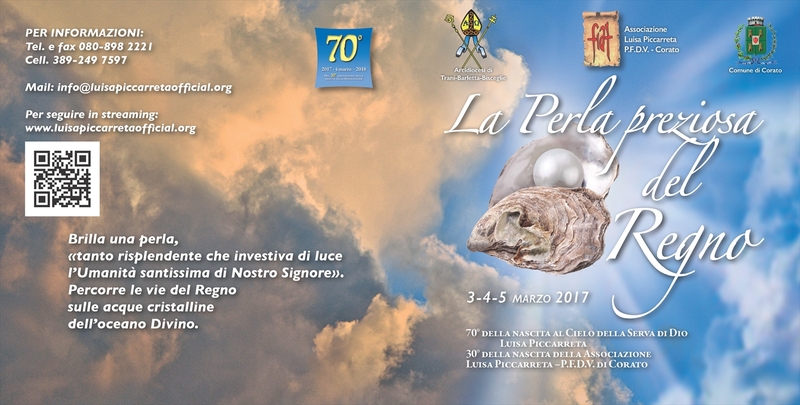 "The Precious Pearl of the Kingdom"
March 4, 2017 - Presentation of the Benedictine community of Divine Will in Carpegna and Talamello –Father Elijah - Shrine of Our Lady of Grace in Corato. 4 March 2017 - Mons. Giovan Battista Pichierri - Sr. Assunta Marigliano - Dr. Marina Labartino: Presentation of the booklet " Testimonies of light" by Editrice Lo Stradone of Corato - Shrine of Our Lady of Grace in Corato. Presentation of the booklet " Testimonies of light"